C'mon everybody, who doesn't want one?! PRESS RELEASE: The Gretsch Custom Shop could not possibly be more proud to introduce a very special 50-instrument run of a meticulously crafted recreation of one of the most famous guitars in rock 'n' roll and rockabilly history - the modified Gretsch 6120 owned and played by Eddie Cochran. Early 2010 will see the long-awaited debut of the Gretsch Custom Shop G6120EC Eddie Cochran Tribute model. During his all-too brief life and career, Eddie Cochran (1938-1960) only ever owned and played one main electric guitar, an orange Gretsch 6120 Chet Atkins hollow-body he bought brand-new in 1955 at age 16 from the Bell Gardens Music Center in his hometown, Bell Gardens, CA. The guitar bore the serial number 16942, and his parents helped him buy it. A sharp young guitarist who was particular about his sound and knowledgeable about guitar design and modification, Cochran hot-rodded his Gretsch with a warmer-sounding "dog ear" neck pickup. It was this guitar that accompanied Cochran on his rise to stardom. It was this guitar that Cochran played on hits such as Summertime Blues, Twenty Flight Rock, C'mon Everybody, Somethin' Else, Nervous Breakdown and Sittin' in the Balcony, which influenced generation of guitarists - and guitar royalty - to come. And it was this guitar that was in the trunk of the car on the April 1960 night that Cochran met his tragic and untimely fate on a winding rural road in Chippenham, England. It is this famous guitar that has now been so painstakingly recreated by Gretsch, with the blessing of the Cochran family and with the reverence and sense of history that absolutely must be accorded in instrument of such import. The delicate job was entrusted to Gretsch Custom Shop master luthier Stephen Stern, an acclaimed craftsman who is well aware of Cochran's place in music history and the historical significance of his guitar. Stern, along with Cochran's nephew, Ed Julson, traveled to Cleveland in January 2009 to examine the famous guitar at the Rock and Roll Hall of Fame and Museum. It should be noted here that the Cochran family has been extremely protective of Eddie Cochran's legacy and identity in general and his personal belongings in particular, not the least of which is his Gretsch guitar. The story goes that the first policeman to arrive on the scene of accident that claimed Cochran's life on Easter Sunday 1960 found the guitar in the trunk of the car and removed it to his own home for several days so that it wouldn't be lost in the public melee surrounding the incident and the ensuing investigation. The instrument was safely returned to the Cochran family home shortly thereafter, and there it stayed for many years. It became an instrument frozen in time: the strings were never even so much as loosened; the other contents of the case - guitar strap, polishing cloth, gig poster, etc., were left undisturbed. Eddie Cochran was inducted into the Rock and Roll Hall of Fame in 1987; his family subsequently allowed the guitar to be displayed there, where it has remained ever since the museum opened in 1995. The January 2009 examination held several emotional moments for all involved - especially Julson, who was only 3 years old when his 16-year-old uncle Eddie bought the guitar in 1955. "To Eddie, it was - along with family - his first or second love," Julson said of the guitar. "For me, it's a part of someone I very much loved. He took exceptional care with it. It went everywhere with him - it was in the car no matter where he was going." Stern and Julson arrived at the Rock and Roll Hall of Fame to find the guitar in what Stern called "very good condition - very little wear on the back; a little on the neck." Gingerly handling the 54-year-old guitar with gloved hands and surgical focus, Stern proceeded to carefully spec out Cochran's guitar in meticulously exacting detail from headstock to tailpiece, leaving no measurement unrecorded, no matter how small. That he was handling a genuine piece of music history was not lost on Stern. "Eddie was a legend, a guitar hero and an innovator," he said. "He was at the birth of rock 'n' roll and rockabilly. He was one of the founding pioneers." "To be able to have access to this guitar and to recreate it, especially being that this was his prime guitar - his only guitar - that he used throughout his career, to be able to hold and examine a part of rock 'n' roll history is just very exciting. You never dream that something would happen like this. I never did. "The result of Stern's craftsmanship is a re-created Gretsch instrument that you could say is truly "something else." Virtually indistinguishable from the original, the Gretsch Custom Shop G6120EC Eddie Cochran Tribute model is authentic in every detail, from the aluminum nut and bridge to the famous "dog ear" neck pickup; from the distressed vintage orange nitrocellulose lacquer finish to the relic gold-plated hardware and BigsbyB6GPVF vibrato tailpiece. Its features include a bound laminated maple body and arched top, a specially shaped three-piece maple/walnut/maple neck with a 22-fret 9"-radius bound rosewood fingerboard, a Seymour Duncan"Dog Ear" single-coil neck pickup, a Seymour DuncanDynaSonicsingle-coil bridge pickup, three-way switching, rosewood bridge base, vintage-style gold GotohSE700-05M tuners, modified plexi pickguard, western block fingerboard inlays (depicting cactus, steer heads and fences), lower body bout "G" brand, and pearloid steer head/Gretsch logo inlay on the bound headstock. 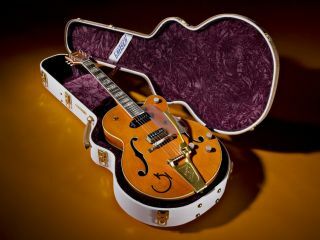 The deluxe hardshell case also contains special commemorative materials, including a reprint of the concert poster found in Cochran's car after the accident, an Eddie Cochran Live at Town Hall Party DVD, a G6120EC Eddie Cochran Tribute model "making of" DVD, a reproduction of Cochran's original guitar strap, a reproduction of the Gretsch polishing cloth found in Cochran's guitar case after the accident, and some other surprises. Frankly, the Gretsch Custom Shop G6120EC Eddie Cochran Tribute model is long overdue. Cochran's direct influence on guitarists such as Pete Townshend, George Harrison, Jimmy Page, Bryan Setzer and many others, and his pioneering contributions to rock 'n' roll and rockabilly, simply cannot be overestimated. Cochran was a bona fide guitar hero in the era before guitar heroes, and one can only speculate on the musical heights he might have reached had he lived beyond the age of 21.His youthful spirit infuses that guitar to this day, and Gretsch is very proud indeed to introduce an instrument bearing his name. "We're very honored to be able to recreate this instrument and have this history to carry on," Stern said. "It's going to carry on Eddie's legacy."